Where Can You Afford to Live after Retirement? Housing is one of the biggest decisions we face as we age, and like any big decision, it is packed full of questions. What type of housing can I afford? What climate, community and geographic location do I desire? What, if any, supports do I need now, and what might I need to access in the future? It’s understandable why many people might want to remain in the place they have called home for years. Friends and family, doctors and hair stylists, favorite restaurants and stores are nearby. Along with familiarity, is the financial piece – the house may be mortgage free. Moving at any age is a chore, but when the move involves major downsizing...well, it’s easier to not move. Read one woman’s story about aging in place. But aging in place takes work, too. The National Institute on Aging (NIA) recommends talking to your doctor about any health problems you currently have and what future supports you might need. Services are available to help with personal care and household chores, including comprehensive aging-in-place programs such as Kendal at Home, but they’re all useless if you can’t make your home safe or can’t afford them. Space adaptations for safe walking, showering, etc. Compare your costs for living at home here. Is Moving to a Smaller Home a Good Choice after Retirement? An estimated 64% of older adults expect to move at least once during retirement, and most of them are looking for a smaller place to call home. They also want to get rid of the snow shovel and lawn mower and may be looking for amenities, such as a swimming pool. Buying a condominium has popular appeal. In exchange for a monthly fee, services such as lawn care and snow shoveling are provided. For many of the same reasons, but with much less financial investment, an increasing number of older adults are returning to renting. “The number of boomer renters is still small. But there were just 10 million in their 50s and 60s in 2005, and in 2015, there were 15 million. They account for more than half of the nation's renter growth in the last 10 years, according to Jennifer Molinsky, researcher for the Joint Center for Housing Studies of Harvard University. What about a Continuing Care Retirement Community? Also known as life plan communities, CCRCs offer a continuum of care, from independent living to assisted living and nursing care. This kind of living arrangement offers many older adults and their families peace of mind, knowing that any future health care and housing needs will be provided. Discover why one couple decided to move from a home designed for retirement living. Fees and services vary greatly so you need to ask lots of questions. What services are included with the fees. Meals? Utilities? Housekeeping? Transportation? 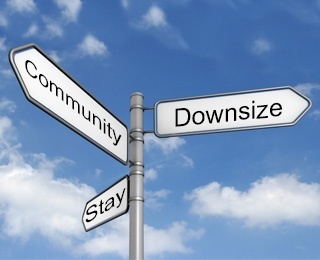 Fees can vary based on contracts, accommodations and resident fluctuations within a community. Quality varies, too. CARF™ International is a voluntary, quality improvement accreditation that indicates a continuing care retirement community has met more than 800 standards. A “comprehensive” or “Type A” contract includes the cost of future long-term care services through entry and monthly fees. Residential services, amenities and health care are typically all-inclusive, with little or no increase in monthly fees, other than inflationary adjustments. Many people refer to this comprehensive contract as “life care” – you join the community at the independent living level, with assurance that higher levels of service will be there for you if needed. Life plan communities also offer tax benefits. Because the entry and monthly fees cover future long-term care costs, a portion of each may be considered a medical expense for federal income tax purpose under IRS Revenue Ruling 76-481. The deductible amounts vary from year to year and are determined annually by the community, based on the relative costs of providing care services. A life plan community can offer a fee-for-service contract, and in that case, the tax deduction scenario is quite different. And communities can handle the deduction differently. Some offer either a deduction on the entry fee or an ongoing deduction on monthly fee, not always both. If you’d like more information about the financial benefits of a life plan community, contact Kendal at Oberlin online or by phone at 800-548-9469 or 440-775-0094. We can provide you with the information you need to make a decision.